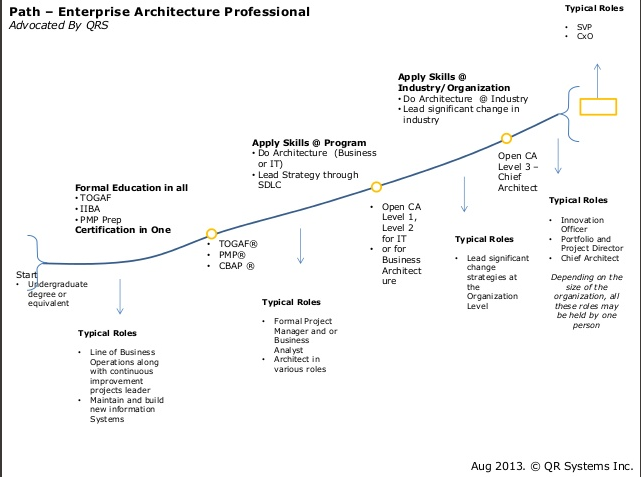 What is the profession of enterprise-architecture? And what should we do about certification, to define and protect that profession? Yeah, it’s much the same questions as before – but perhaps becoming a bit more urgent as the thrust from Open Group and the like to determine the nature of the EA-profession gathers more momentum. And yes, I’ll freely admit an ulterior motive here – because if the Open Group’s arbitrarily-narrow concept of ‘enterprise-architecture’ does take hold, I and anyone like me who does work at a whole-enterprise scope would effectively be banned from practice. Which would not be a good idea, not just for us but for the profession as a whole – though I’ll expand on that latter point in a moment. It’s intended to illustrate a ‘typical’ career-path for an enterprise-architect, from undergraduate-degree to SVP or CxO. And it’s a fair bit broader than the kind of career-path assumed in so many conversations I’ve had at Open Group conferences and elsewhere: for example, although it’s still painfully IT-oriented, it does consider the possibility of other routes, such as via business-analysis (IIBA) or project-management (PMP). Yet there are still an awful lot of hidden assumptions there: for example, that enterprise-architects are only ever employees, and pretty much only in large organisations. And, in the background, the inevitable assumption that it’s really mostly about IT. Which it is not: therein lies the real problem. To explain that last point, let’s look at the history of TOGAF itself. It started out as a set of models and methods (i.e. a framework) to help manage the changing picture of IT-infrastructure in large organisations and consortia – initially in government, and then later in strongly IT-oriented industries such as banking, insurance, finance and tax. And it pretty much stayed that way until TOGAF 7, when – as one of the original members once told me – they suddenly realised people were actually using it, and therefore needed something a bit more systematic to hold it together. But notice a subtle yet crucial point that’s easily missed here: it’s still primarily about IT-infrastructure. In essence, the whole thing is an ‘inside-out’ view of the overall enterprise, from the perspective of IT-infrastructure – like looking upward from the bottom of a well. Hence, for example, ‘Business-Architecture’ in TOGAF is still essentially best described as ‘anything not-IT that might affect IT’ – it’s not ‘business-architecture’ in its literal sense of ‘the architecture of the-business-of-the-business’, focusing on things such as business-models, financial-architectures, value-stream translations and the like. And this reflex IT-centrism still permeates just about everything that comes out of the self-proclaimed major-players in enterprise-architecture – including Jason’s ‘career-path’ description above. Yet this IT-centrism – in fact any kind of ‘anything-centrism’ – is exactly what not to do in an enterprise-architecture. This becomes immediately obvious if we turn round at, say, the business-architecture level, and look back ‘downwards’ – ‘outside-in’ or ‘inside-in’ – towards the implementation and operational layers of the organisation. From this perspective, we’re able to see IT in its proper proportion: rarely more than 10% of any organisation, and usually a whole lot less. Yes, IT permeates pretty much everything – but so does everything else. Facilities and machines and people and skills and relationships and much, much more are all exactly as important as the IT – because without those system-elements, the system can’t work as a system. 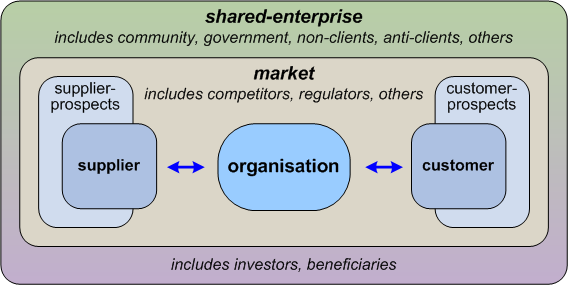 The architecture of a business includes everything in that business, necessarily as exactly ‘equal-citizens’ – not where one domain such as IT-infrastructure is arbitrarily accorded priority over everything else, with every everything else all but ignored, such as we see in Archimate and TOGAF and so many other approaches to so-called ‘enterprise’-architecture. So let’s hammer this point home yet again: In a viable architecture, everything depends on everything else – we cannot and must not allow any one domain to set itself up as ‘the centre’ of it all, because, in practice, especially at the operational level, everywhere and nowhere is ‘the centre’, all at the same time. And the notion that ‘professionalisation’ and ‘certification’ for that entire scope of action should be driven by and controlled by that one tiny sliver of a subset of that scope is not merely absurd, but extremely dangerous. To illustrate why, let’s use a healthcare analogy. Healthcare is a huge shared-enterprise, revolving around a shared story of ‘health’ and ‘being healthy’, in its broadest possible sense. There are vast number of players, of whom some would focus more on ‘resolving illness’ – all the various subsets and sub-disciplines of medicine – whilst others are more about ‘maintaining wellness’ – which would include yoga-teachers to swimming-clubs to nutritionists and celebrity-chefs and many, many more. For the sake of this analogy, though, let’s focus just on the ‘medicine’ side of the story, and focus in again on just one discipline within medicine: radiology. Electromagnetic or radiation-based diagnostic-imaging – X-rays, CAT-scanners, MRI-scanners and so on – is obviously important in medicine. But there are also real dangers there: if we get it wrong, people can get very ill, or die. Hence, working in parallel with other disciplines, a distinct profession has developed to manage radiology, particularly in hospitals and the like: radiologists. So let’s go to a hospital. There, the radiologists have their own department, filled with large, impressive technology that they alone are allowed to operate. You’ll see their work in use throughout the hospital, on the wards, in the operating-theatres, in consulting-rooms. Yet they’re kind of sideways-on to everyone else: their work is used in the operating-theatre, but unlike nurses or anaesthetists or physicians, or even the janitors who keep everything clean before and after, they themselves would not be part of the active surgical-team. Odd. We could note that there’s a kind of suite of intersecting-sets here: radiologists do medical-imaging, but other teams do so too, with different technologies – ultrasound, for example, or plain old photography and illustration. And the same kind of technologies that radiologists use – radiation-emitting devices or one type or another – are also used by others for other purposes entirely, such as radiotherapy. Yet if we take the same line as Open Group and the others have done with regard to enterprise-architecture, the radiologists would claim that their form of medical-imaging is ‘the sole reason’ for everything – it’s the centre of the medical world! The surgeon and the nurses and all of the others are there only to act on what they’re shown by the diagnostic-imaging; the patient being operated on is viewed solely as an ‘diagnostics-user’, in context of ‘diagnostics-processes’, ‘diagnostics-services’ and the like. The other equipment-items in the hospital, the ward and the operating-theatre – and even the physical operating-theatre itself – are deemed not to exist, or at least can’t possibly matter, because they’re not associated directly with radiology-diagnostics itself. Yeah – absurd, isn’t it? You’d recognise straight away that to make any sense of the role of diagnostics in an operating-theatre, or even the operating-theatre itself, we need to understand the whole of what happens there – the system-as-system. We’d need to place that in turn in context of the hospital as a whole, as a larger system-as-system; even more, we’d need to place it in context of the patient – the experiences of that patient, a ‘customer-centric‘ approach. And we’d also need to interpret all of what happens in terms of the story of medicine, and, in turn, the broader story and shared-enterprise of health and healthcare – especially if we need to look at from a perspective such as health-of-the-nation, or epidemiology, or any other necessarily whole-of-enterprise view. Everything is in context of everything else: there is no single ‘the centre’. The closest that we have to a ‘the centre’, in fact, is the whole-enterprise story. And the moment that any one domain forces upon everyone else that it alone is ‘the centre’ around which everything else must revolve, the system-as-system will start to break down, fail, implode, collapse into a fragmented mess of disjointed pieces. Which is exactly what we see with the mess created by the still-endemic IT-centrism that permeates through far too much of so-called ‘enterprise’-architecture. Unless the EA covers the architecture of the whole enterprise, with equal attention paid to every aspect of that system-as-system, it cannot and should not be called ‘enterprise-architecture’. There is, of course, no reason why subsidiary disciplines should not exist, covering specific domains of the overall architecture – exactly as radiologists cover a specific aspect of medicine. There is an undoubted need for professional standards, and professional certifications: radiologists, for example, do indeed have certifications – but specifically in radiology, which don’t claim to define the whole of medicine. And exactly as with radiologists, the work that the various types of domain-specific ‘enterprise’-architects do should be named appropriately: radiologists do not claim that they alone do medicine, and likewise TOGAF-style IT-architects should not describe themselves as enterprise-architects. Why not? Well, take a careful look at one key current end-result of that mess: we have recruiters and others seemingly convinced that there is no difference whatsoever between detail-layer IT-architecture and, for example, highest-level business/market strategy and business-model development – because at present they’re all called ‘enterprise-architecture’. Which, clearly, they’re not: IT-architecture is in the scope of enterprise-architecture, yes, but in no way is it ‘the architecture of the enterprise’ – a very different beast, often requiring very different skillsets from those used in detail-layer IT-architecture. Real enterprise-architects – those working at that true whole-of-enterprise scope – are a fairly rare breed. By necessity, all are experienced system-thinkers; by nature, they’re often a bit eccentric, because the work routinely requires an ability to look at things from a seriously-sidewise perspective – from every perspective, in fact. So whilst, yes, it’s probable that most of us will have a serious amount of IT somewhere in our CVs – as Jason Uppal’s ‘career-path’ suggests – a closer look would show that we’re more likely to have bumbled around at many or most of its edges, bouncing around between disciplines, rather than sitting solely in one domain for years on end. And for a lot of us, even the concept of ‘career-path’ in the usual sense makes little sense. Take my own case: I’ve never yet been an employee – only ever either an independent, a contractor or consultant. I’ve not so much had a career, as that I’ve careered (careened), from place to place, industry to industry, role to role, discipline to discipline – hence why I find it so much easier than most people seem to do, to link across between disciplines and domains, so as to make sense of an architecture as a whole. committed myself to researching, developing and disseminating tools and techniques for whole-enterprise-architecture – and I still am. So yeah, I’ve ‘careered’ all right – yet that amount of ‘careering’ is not untypical for most of the EAs that I know. I’ve met at least two enterprise-architects who’d previously worked as building-architects; another was a naval-architect, designing ships rather than IT-systems; another had been a mathematician specialising in quantum-physics and satellite-design – literally a rocket-scientist. A fair few arts-graduates, too. Sure, there’ve been a few who actually have followed Jason Uppal’s ‘standard’ career-path – but they’ve tended very much to be the exception rather than the rule. Overall, the only thing we all have in common is that we now work in some aspect of enterprise-architecture – and that’s it. In which case, whence certification? The only thing that the proposed ‘professionalisation’ around these certifications from Open Group and elsewhere would do is that it would shut out most of the people who actually do do enterprise-architecture at the real whole-of-enterprise scope – because most of them aren’t ‘IT-people’, and in many cases don’t ever want to be described as such, either. Time for a rethink, folks… a serious rethink, I’d suggest? Certification has pluses and minuses. Employers like it because they think it makes it easier to recruit qualified people. It does create a structure for a common body of knowledge. However, doing a certification course early in the learning process may not be beneficial, because the need to get through the exam tends to limit it to a rote learning experience, rather than getting a practical grasp of the concepts. Learning to pass an exam is not the same as learning to actually do something. In addition to the IT-centricity problem that you mention, one issue that I see with certification of enterprise architects is that about 50% of the qualities they need are ‘soft skills’. These include communication, conceptualisation, problem-structuring, collaboration, facilitation and relationship-building, which are highly contextual and don’t really lend themselves to meaningful certification. Voytek – I do agree on the need for pragmatism, but unfortunately I’ve run right out of patience on ‘baby steps’. Yes, sometimes the gentle touch is needed, but right now it feels like most of these businesses that we deal with are more likely to need a really hard kick up the backside. To me these days it seems far less about immaturity in the sense of limited capability, and more about wilful irresponsibility, a (bluntly) childish refusal to wake up and get the job done that needs to be done. Organisations, industries and entire economies are being destroyed by this childishness: we simply don’t have to time to wait around any longer. And that point needs to be hammered home as hard as we can, every inch of the way. What’s with the “if”? Once again you confuse cause and effect. The Open Group is its members. The Open Group staff, with very few exceptions, are not enterprise architects — they are facilitators, who provide support to The Open Group’s members, who in turn develop the standards published under The Open Group’s name. The Open Group’s member organizations’ representatives represent the conventional wisdom about enterprise architecture. They are not creating this conventional wisdom, they are codifying it. So if you want to blame someone for the conventional wisdom on enterprise architecture not corresponding to your vision of what it ought to be, blame the entire practitioner community, and the companies they work for, because that’s where its coming from. Ask people what the most important book about enterprise architecture they have read is. A disproportionate number will cite Ross Weill and Robertson, “Enterprise Architecture as Strategy”. Guess what concept of enterprise architecture this book espouses. Did the authors get this concept from The Open Group? No. MIT Sloan CISR does empirical research — they got it from the practitioner community and their employers. So stop blaming The Open Group as the source of all your angst. This isn’t because it’s wrong, it’s more importantly because it’s ineffective. The Open Group and TOGAF will not change their concept of enterprise architecture until the community as a whole does. Pi**ing on The Open Group is only going to get you branded as a crank by the greater community of enterprise architects who value what The Open Group provides because it corresponds to what they think they need, because it addresses what their employers want them to do. That’s a closed loop that needs challenging. Tom challenges it. Yeah, Phil, thanks on that. “That’s a closed loop that needs challenging” – yep, exactly. I’ve really have run right of patience on the circular-reasoning and frankly-ludicrous special-pleading that goes on this space. We don’t have time to waste on it any more – or on its promoters and practitioners. Enough is enough – really. “Enough already!”, as the old Jewish phrase goes. Perhaps the practitioner community haven’t been reading the right books. If they had read Paradigm Shift (1993) by Don Tapscott and Art Caston, or Adaptive Enterprise (1999) by Stephen Haeckel, they might have been a bit more inspired to try and break out of IT and extend architecture to the full enterprise. However, this is challenging to do when IT is positioned as a service function, so you have to grab what opportunities you can to show how a more unified approach to business change can work, making friends with all the different constituencies that work in this space. I’ve had some involvement with a couple of books recently that aim to present a wider concept of EA. – I was a technical reviewer on Milan Guenther’s ‘Intersection’ a which presents a nice synthesis of EA and Design thinking, bringing in the people dimension, and showing how different disciplines can collaborate on enterprise design. – Like Tom, I contributed a chapter to ‘Beyond Alignment’ a book edited by John Gotze and Anders Jensen-Waud, which shows how Systems Thinking can be applied in architecting enterprises. In addition to my previous comment. I’d like to endorse what Voytek said earlier about the need to take ‘baby steps’. For example, find a problem or opportunity with a strong IT element that requires co-operation across business departments, and facilitate a cross-functional approach to addressing it. 1 Pings/Trackbacks for "And more on EA certification…"